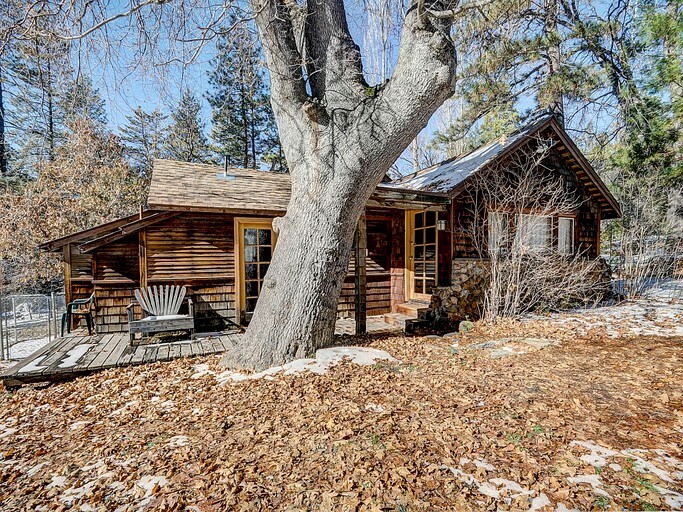 Very comfortable home with everything in good working order. Hosts placed us there after an original booking had gone very wrong. We are coming back. 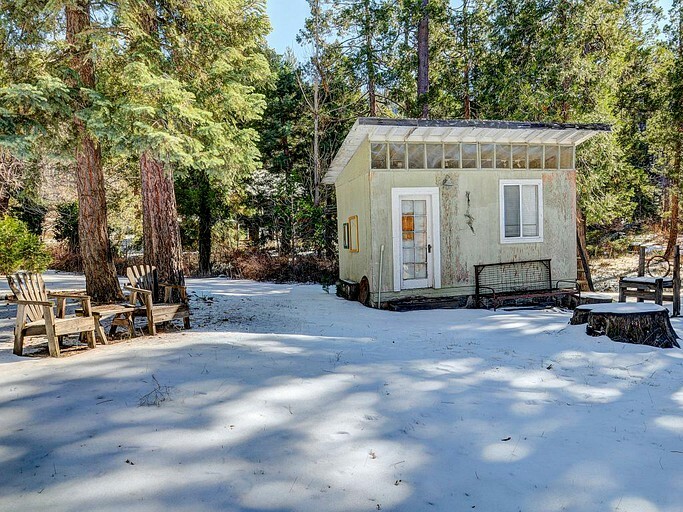 This comfortable dog-friendly cabin rental in Idyllwild, California, is a lovely accommodation for those looking to unwind during their stay. 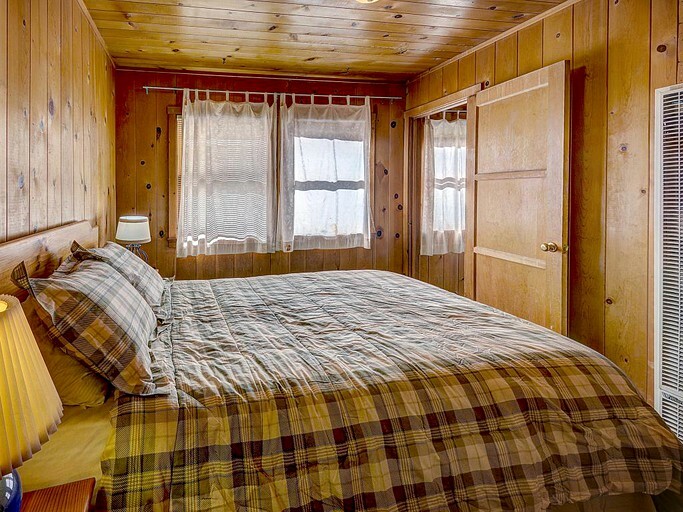 In this cabin, there is plenty of room for up to eight guests to sleep soundly. 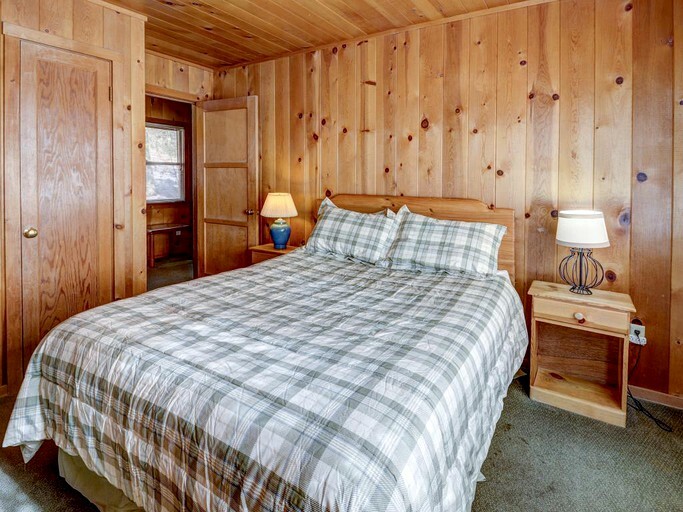 Two spacious and tastefully-decorated bedrooms both have queen-size beds, and a third bedroom has a cozy double bed. 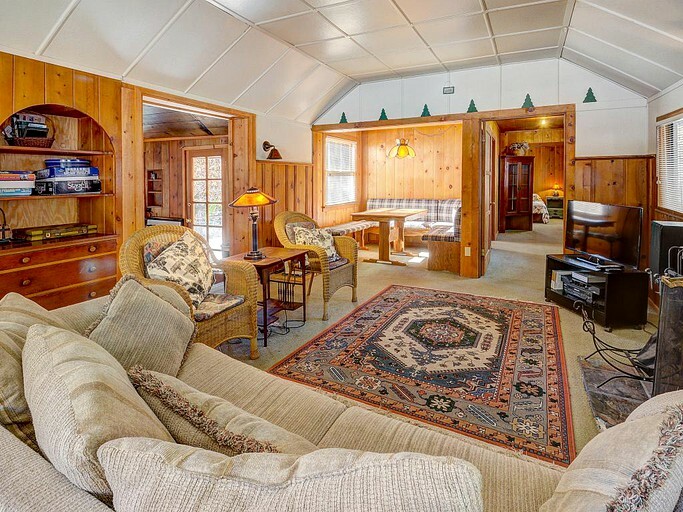 There’s also the sofa bed in the lounge, for two people, which is large and comfortable. 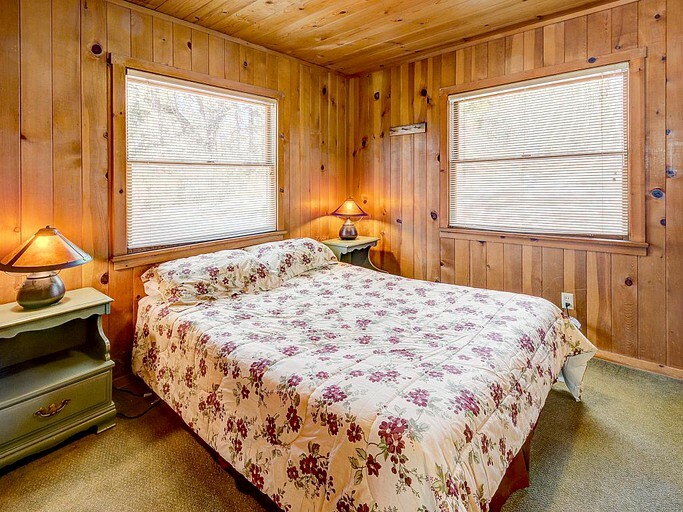 The soft, quilted bedding, soothing decor, and shaded windows throughout the cabin will ensure that glampers have a gentle, peaceful night’s sleep in tranquil surroundings. In the morning, guests can freshen up in one of the two showers, ready for an exciting adventure in the mountains. 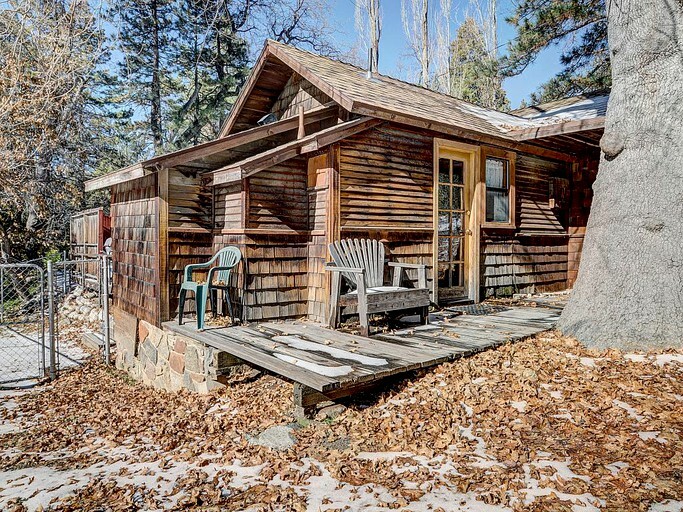 This pet-friendly cabin’s decor is eclectic and refreshing, from the pretty and elaborate rug on the floor, to the antique-style furniture throughout the property. 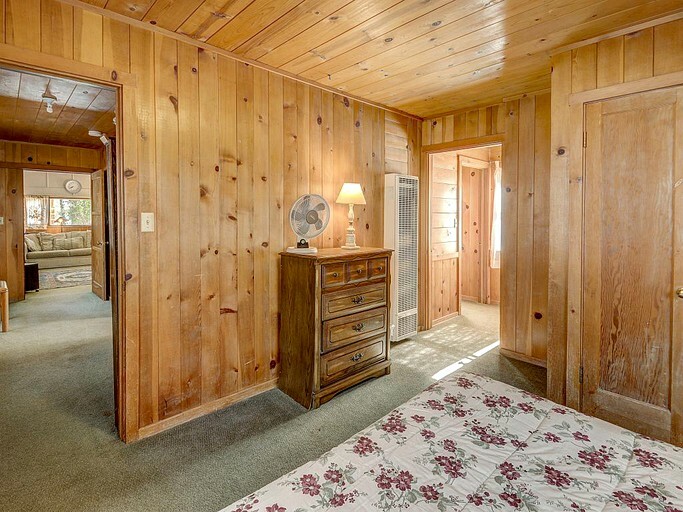 Polished wood paneling on the walls and soft, beige-carpeted floors give the place a warm and inviting ambiance. 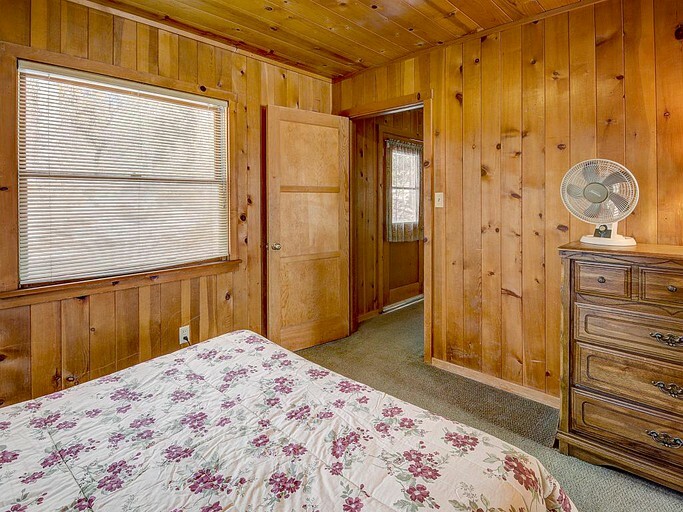 Plentiful windows let in lots of natural light from the outside, and allow for fantastic views of the forest from the inside. 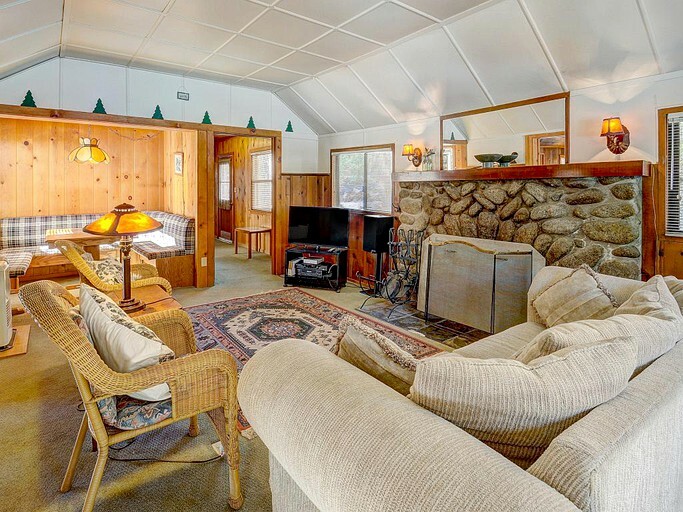 The focal point of the spacious living room is the attractive stonework fireplace, with its warming wood-burning fire. 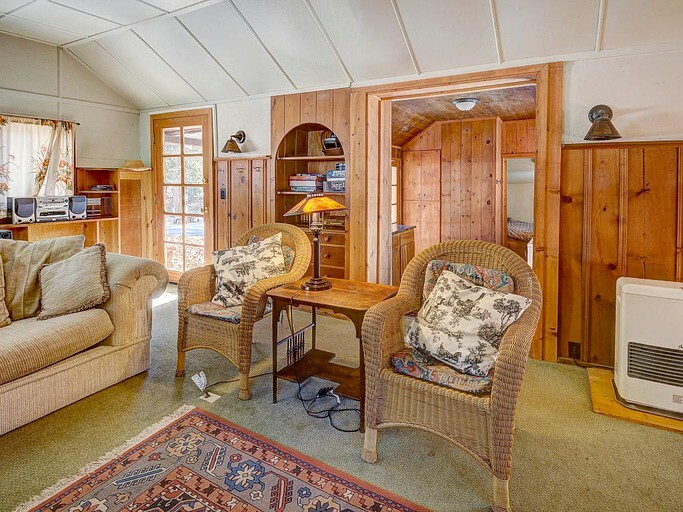 The plush sofa and cushioned armchairs are ideal for an evening spent chatting and reminiscing by the hearth. When guests want to put their feet up and watch a movie, they can turn on the flat-screen cable TV and DVD player, also found in the lounge. 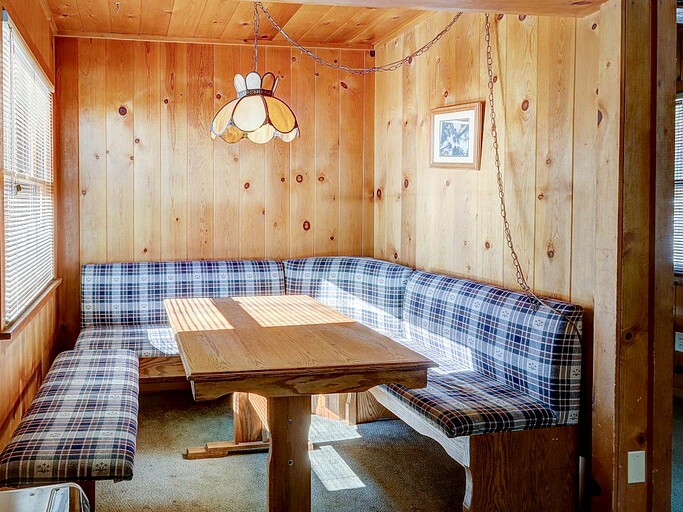 Tucked away in its own little alcove is a bright and cheerful dining table, with soft, padded seats and its own window. It’s a fantastic space for a sociable meal, with family or friends. 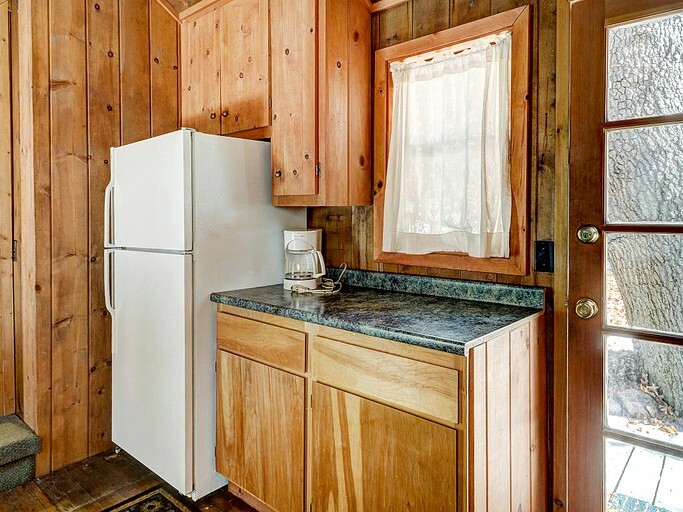 Next to the lounge is a functional and contemporary kitchen, complete with plenty of convenient appliances. Traditional wooden units and marble-effect counters make this an enjoyable place to prepare a family meal. 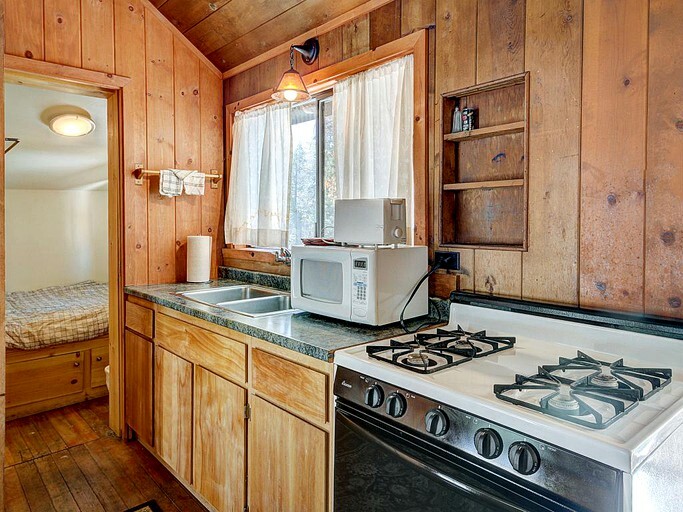 There’s no shortage of utensils and dishes, so glampers will be sure to find everything they need. 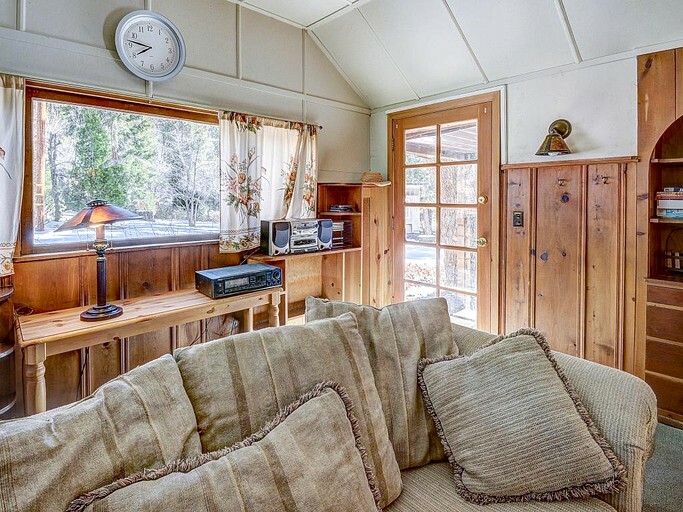 This charming cabin is suitable for up to eight guests. 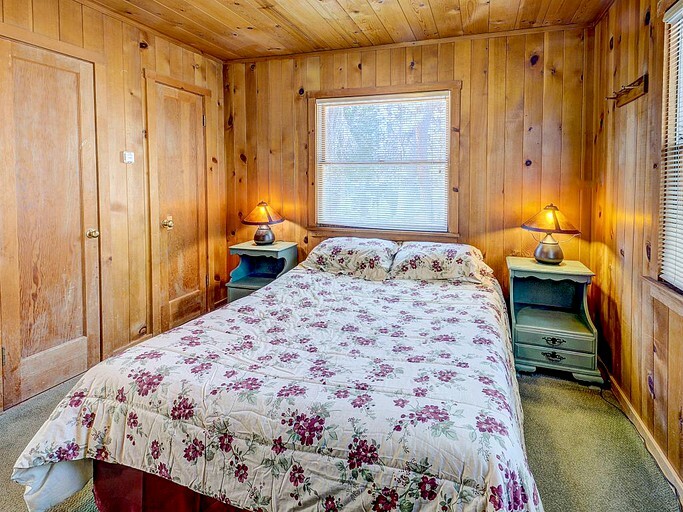 There are three bedrooms, two with queen-size beds, and one with a double bed. Further sleeping space comes in the form of a sofa bed in the lounge. 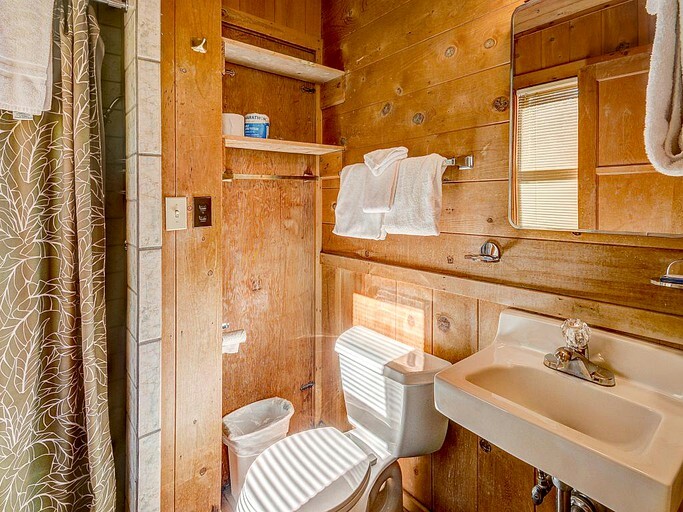 For glampers’ comfort and convenience, there are two bathrooms, and both have showers. 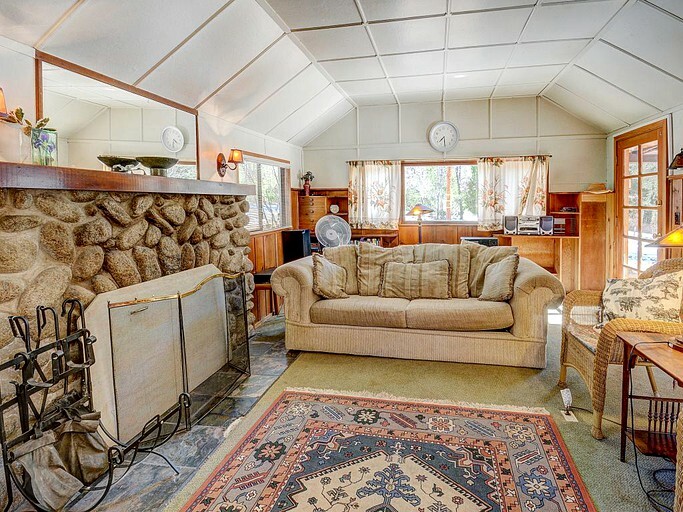 The living area has a large, wood-burning fireplace, so glampers can stay warm and snug. 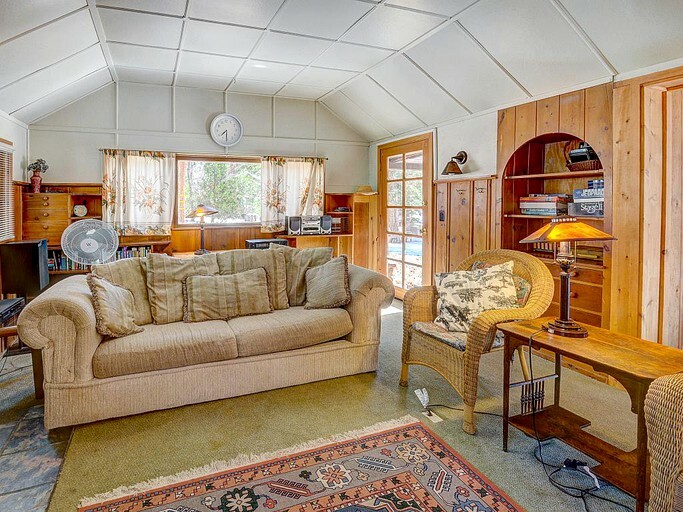 Guests will benefit from plenty of seating space, as the living room has a large sofa and two additional armchairs. 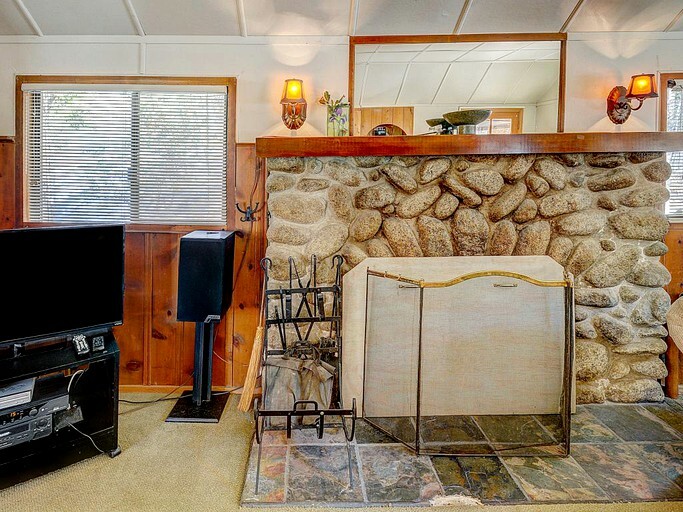 There is a flat-screen cable TV, a DVD player, and a stereo music system in the lounge, for entertainment. 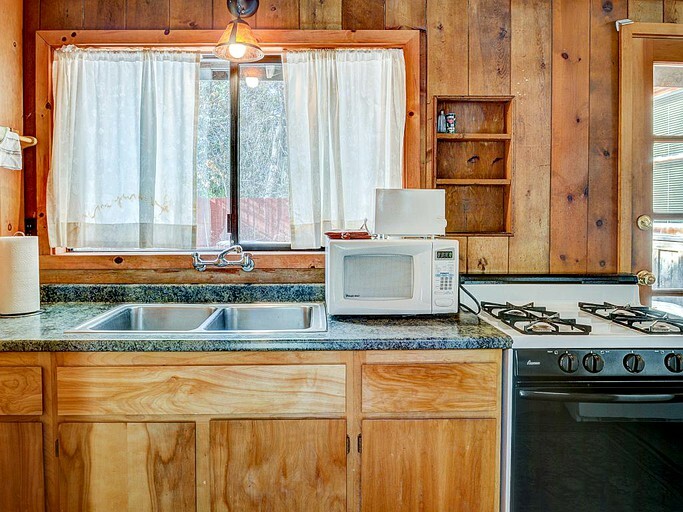 The fully-equipped kitchen boasts many modern conveniences, such as a fridge, a freezer, an oven, a microwave, a coffeemaker, and a toaster. A great array of cooking utensils makes it easy for guests to prepare tasty meals. 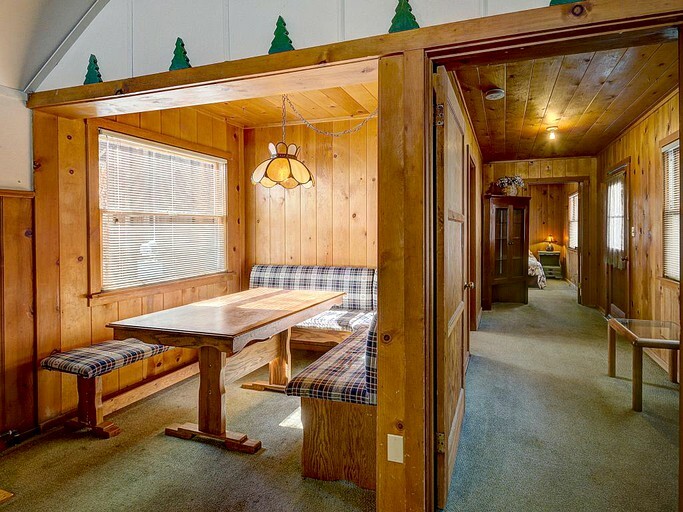 A dining table is situated in the living area, at which glampers can eat and drink in comfort. 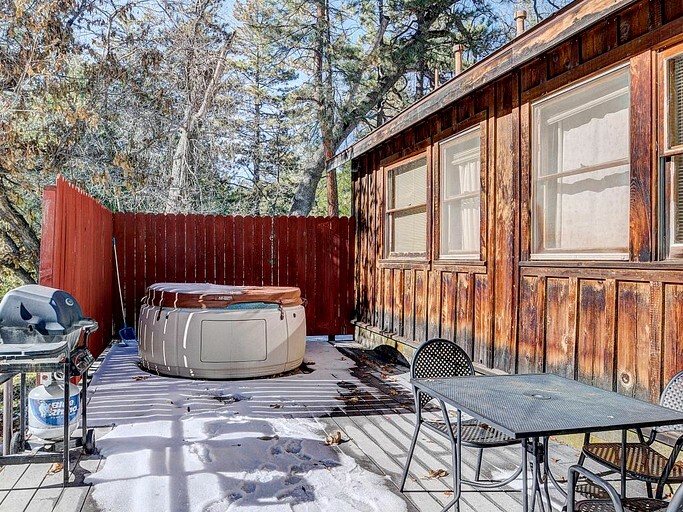 Outdoors, the cabin has a deck area, with plenty of patio furniture. 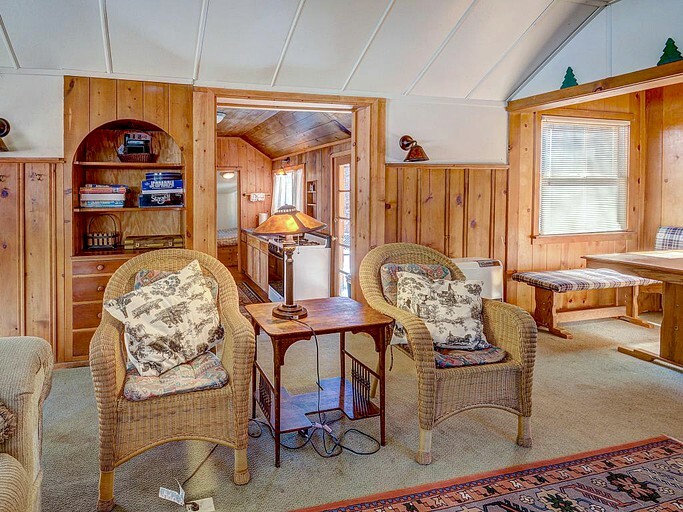 The property also has the added benefit of a gas barbecue, giving glampers the option to dine al fresco. 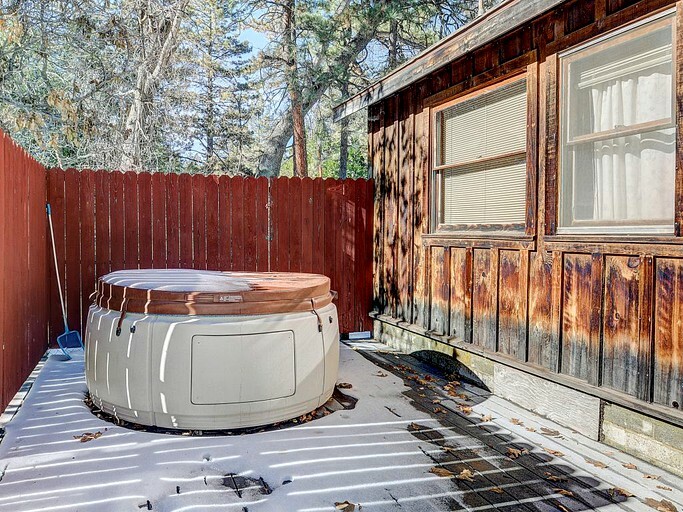 A private hot tub can be found next to the property, adding a touch of luxury to this cozy cabin getaway. 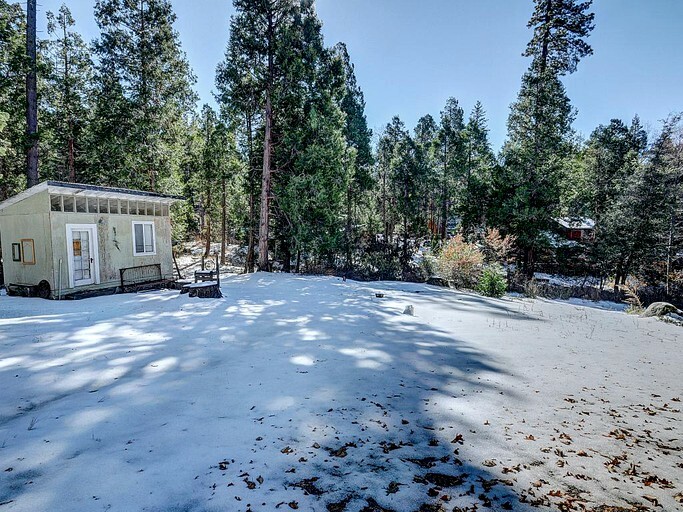 Due to the mountain location of this property, 4WD traction may be necessary for access during the winter months. 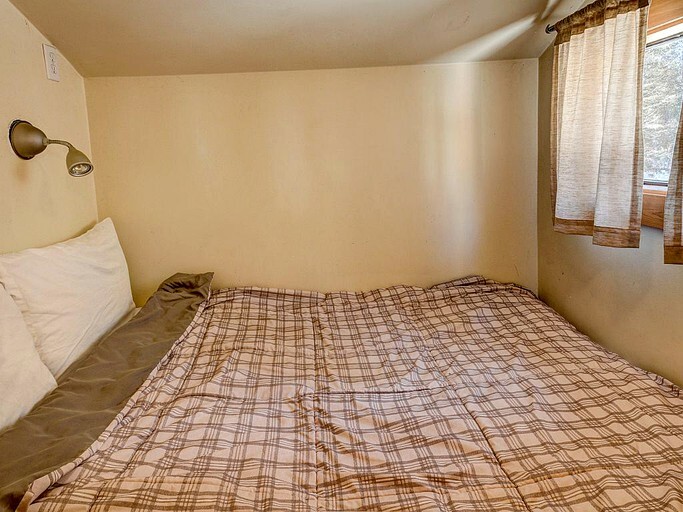 Guests should note that there is no internet access in the cabin.